There is no evidence that Charles Whitman was under the influence of drugs when he climbed the UT tower on August 1, 1966. 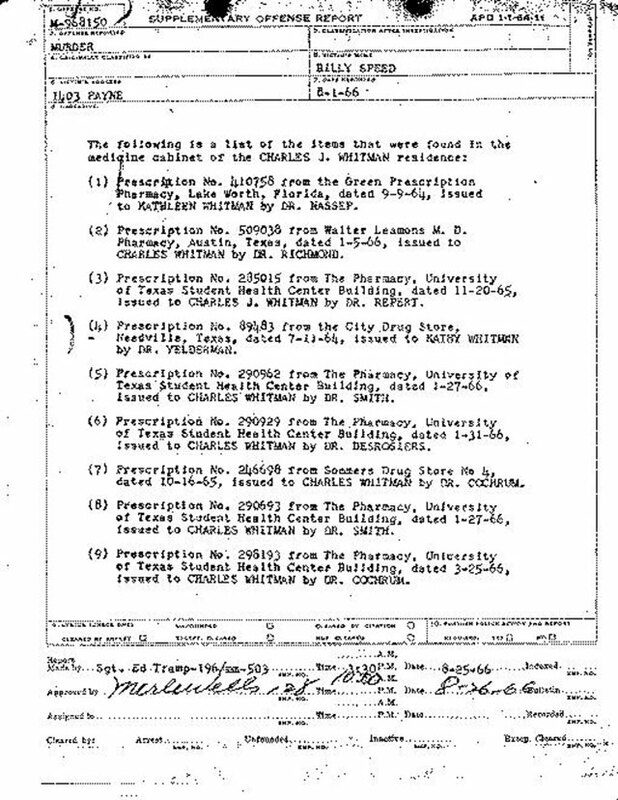 An analysis of tissue from Whitman’s liver, stomach, kidney, and brain conducted by the Armed Forces Institute of Pathology turned up negative.1 An expert committee commissioned by Texas Governor John Connally concluded that although Whitman was known to take stimulants as a study aid, “there was no evidence of acute or chronic drug toxicity” on the day of the shootings.2 As A Sniper in the Tower author Gary Lavergne points out, Whitman spent two days planning and executing the murders of his wife and mother, and the mass shooting of dozens of people, with the precision and calculation uncharacteristic of someone affected by an illicit substance. All of these statements are true. So why even raise the issue of drugs? There is an enormous gap in the discussion of the UT tower shooting when it comes to Whitman’s substance abuse. The U.S. Food and Drug Administration, Texas Board of Pharmacy, and the Governor’s Commission all investigated whether allegations that he took amphetamines “like candy,” routinely induced insomnia for days on end, and at times exhibited severely compromised cognition and behavior could have had any connection to his actions that day.3 Their findings, particularly of the FDA, are disturbing to say the least - although not why you might expect. Regardless, those inquiries were derailed upon the discovery of the tumor in Whitman’s brain.4 For sure, if there was anything in his body that made him “snap,” it must have been that. 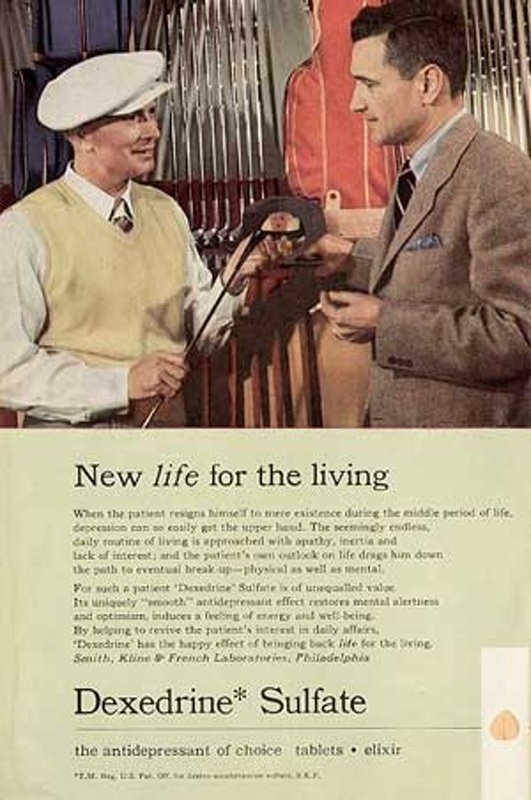 Advertisements for Dexedrine in the 1960s appealed to anyone who simply felt the need for a pick-me-up. The role of substance abuse never resurfaced as a line of serious inquiry. Looking back at reports compiled at the time, it’s hard to understand why not. Given the relative awareness of the dangers of amphetamine abuse in 1966, it’s difficult to pin down why Whitman’s habit did not raise more of an alarm among his family and friends simply in terms of his general health. FDA interviews revealed that Whitman was quite open about his use of medication to stay awake, and most of his friends and extended family knew what kind he took. The exception may have been his father, who apparently thought he only pills he took were caffeine. The lack of an alarm is most striking in light of Whitman’s consultation with psychiatrist Maurice D. Heatly. Whitman was referred to Heatly by a physician at the UT Student Health Center in March 1966, complaining that “something was happening to him and he didn’t seem to be himself.”17 Despite the fact that the referring doctor had just issued Whitman a prescription for Valium, there is no mention in Heatly’s report about substances of any kind. Given Whitman’s openness about his drug use with family, friends, and doctors, it is unlikely he would have denied it if asked.18 Why Heatly didn’t bother to inquire boggles the mind. There is too much else about Heatly that also boggles the mind to touch on here; curious minds can read about him elsewhere on this website. An effort was made to determine the source of Whitman’s drugs. He apparently had a source not only of amphetamines, but also librium and valium. This tended to indicate a drugstore as the probable Whitman drug source. By further processes of deduction it was suspected that Whitman’s source of drugs may have been the drug store in his wife’s home town of Needville, Texas. He was known to have traded at this drug store. As Kathy’s father Raymond Leissner later told investigators, the Needville drugstore was the town’s primary gathering place, so he saw nothing unusual in the fact that Whitman would go there during each of his monthly visits. He also noted that the store owner, Hugo Frank Ley, Jr., was a close family friend, particularly to Kathy. The report then characterizes the response of Kathy’s mother, Frances Nelson-Leissner, about Whitman’s possible source of drugs as “frequently contradictory or confusing.” Technically, this is true. But this was a mother who days earlier had been robbed of her only daughter by a man she had once told directly: “By trying to completely dominate Kathy you are destroying the very things which attracted you to her in the first place.” Whatever role the Needville Pharmacy may have played in this tragedy, “contradictory” and “confusing” are perhaps the least relevant adjectives to describe Mrs. Nelson-Leissner’s situation. While it is not necessarily the FDA’s job to have sympathy for the unwitting victim of such a twisted, devastating catastrophe, the circumstances were clearly unbearable. The Texas Board of Pharmacy’s audit of the Needville Pharmacy, run by Leissner family friend Hugo Frank Ley, Jr., revealed a significant shortage in stock. In the end, the FDA did not establish a definitive connection between Whitman’s substance abuse and the UT tower shootings. It left open the question of whether the prolonged sleep deprivation itself could have been a factor, but his behavior in the days before the shooting was not reminiscent of the stunted cognition his friends had described. Despite some speculation at the time that Whitman suffered from amphetamine psychosis, there is no evidence that he experienced the visual or audio hallucinations characteristic of that diagnosis. Herein lies the lost value of including substance abuse in a broader discussion of the tower shooting. Davis and other advocates of greater regulation were adamant that amphetamine abuse was a national crisis. Whitman’s habit was part and parcel of a dangerously unstable lifestyle, one that he was increasingly unable to control towards the end of his life. It was not behavior that could be subsumed within the label, as Dr. Heatly gave him, of the “all-American boy,” except for in a sickly ironic fashion. Recognizing that Whitman was unquestionably a troubled individual, the Governor’s Report recommended that the University of Texas develop comprehensive mental health and counseling programs. That request was followed through to the hilt. No recommendations were made in regards to substance abuse. If a separate recommendation for a general “health program” was meant to include narcotics, nobody seemed to notice. As noted above, the university only began to revisit its approach to drug policy in late 1969, along with the rest of the country. It seems a lost opportunity that Whitman’s case was not at least used to put a face on the epidemic. It has taken this country a long time to come to the realization that prescription drug abuse is a crisis that cuts across class and race. Decades of normalization allowed a Caucasian, middle-upper class, male ex-marine to spend four years feeding an increasingly destabilizing drug habit and suffering virtually no social or economic consequences for it. The fact that his drug use was not directly responsible for the tower shooting does not render its existence irrelevant. Ignoring this side of Whitman’s life only helps perpetuate the myth, just now slowly beginning to die, that drug abuse is primarily a problem for minority communities and the poor. If we are to debate whether Whitman was obsessed with guns, suffering from a mental health crisis, the victim of an abominable father, an overbearing domestic abuser, an usurer, a gambler, or an “all-American boy,” then he at least does not deserve our hesitation in calling him a criminal drug addict. He may be all of these things or none of them, but perhaps the least we can do is be consistent. “Report to the Governor, Medical Aspects, Charles J. Whitman Catastrophe,” Austin History Center. Jerry Hall. “Tower Sniper ‘Ate Drugs Like Popcorn.’” Unidentified newspaper article, Gary M. Lavergne Papers, Box 5a, Folder 4.000, Dolph Briscoe Center for American History. J.W. 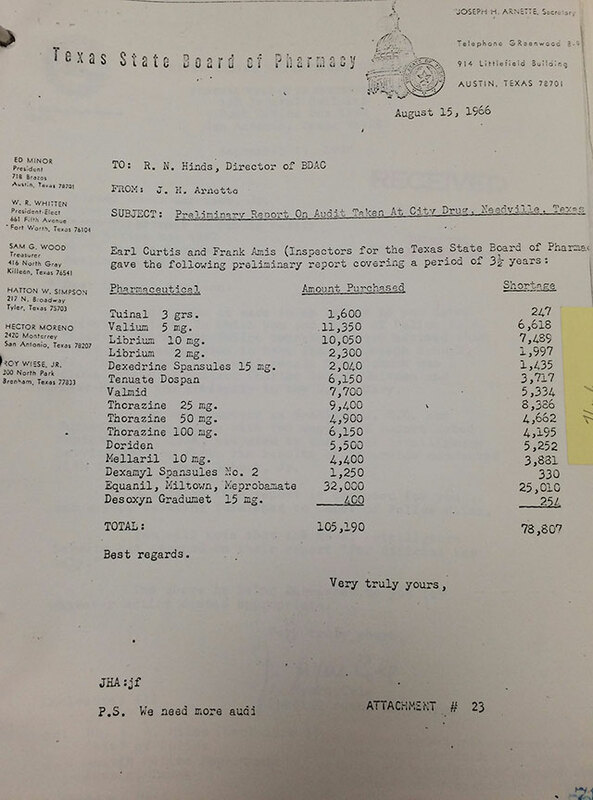 Hand, Interim Report of Investigation, Food and Drug Administration, Bureau of Drug Abuse Control, from the files of the Texas Department of Public Safety at the Texas State Library and Archives Commission. U.S. Food and Drug Administration Affidavits, from the Austin Police Department files, Austin History Center. Inventory of medicine cabinet of Charles Whitman, Supplementary Offense Report, from the Austin Police Department files, Austin History Center. Interim Report: Recommendations Concerning University Drug Policies and Procedures, August 1, 1970, from University Committee on Drug Policies and Procedures, UT Dean of Students Records, 1925-1986, Dolph Briscoe Center for American History. Dr. Maurice Dean Heatly report on Charles Whitman, March 29, 1966, from the Austin Police Department files, Austin History Center. “Whitman ‘ate drugs like candy’.” The Austin Statesman. March 7, 1967.